OAKLAND, Calif. – Steve Kerr provided a strong message, just not from his usual spot on the bench: Play with urgency from the opening tip this time. Stephen Curry had 29 points, seven rebounds and seven assists in three quarters and the Warriors trounced on the short-handed Spurs, running away from San Antonio for a 136-100 rout Tuesday night and a 2-0 lead in the Western Conference finals. Kevin Durant added 16 points and Draymond Green provided another impressive all-around performance with 13 points, nine rebounds, six assists, two steals and two blocks. Rookie Patrick McCaw had 18 points and five assists off the bench shooting 6 for 8 as Golden State earned its second-most lopsided postseason victory ever to go to 10-0. The 36-point Warriors’ win is second to a 39-point victory for Philadelphia at St. Louis on April 6, 1948. Leonard re-injured his left ankle in Sunday’s 113-111 Game 1 loss after coming down on Zaza Pachulia’s foot. Popovich on Monday called out the Warriors starting center for the “dangerous” and “unsportsmanlike” closeout – which had Pachulia insisting he is not a dirty player, was only playing hard, and felt badly that the All-Star forward was injured. An X-ray on Pachulia’s bruised right heel was clear but he was scheduled for an MRI on Wednesday. The bench contributed a season-best 63 points. “They came out with a sense of urgency from the beginning and they played that way for 48 minutes,” acting Warriors coach Mike Brown said. Klay Thompson, still struggling to find his steady shooting touch, had 11 points, six rebounds and four assists. The Warriors had 39 assists – the most by any team this postseason – including 30 on their initial 38 baskets. Simmons started in Leonard’s place and made 6 of 9 shots to begin the game while the rest of the Spurs were 3 for 22. Popovich wasn’t about to guess whether Leonard would return in time for Saturday’s game, saying it could be Friday or even game day before that would be determined. 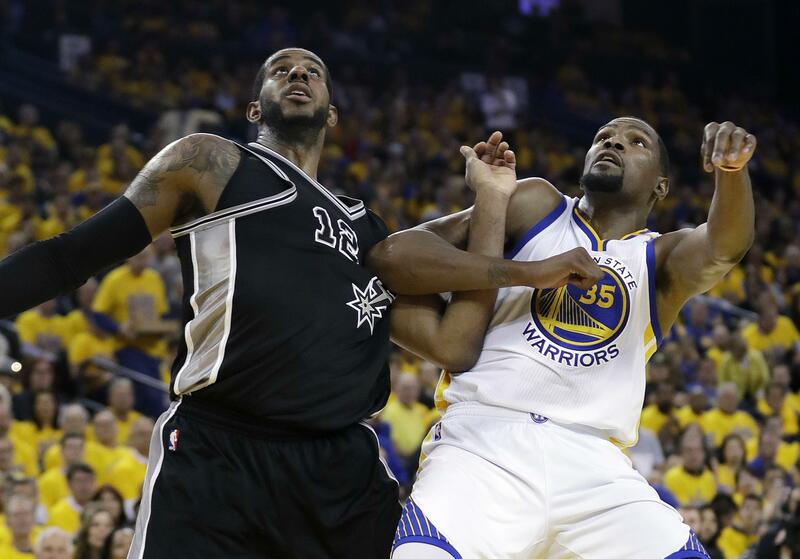 Spurs: The Spurs had 23 offensive rebounds after 14 in Game 1. … Patty Mills, playing in place of the injured Tony Parker, had another quiet night. After he went 1 for 8 and missed all six of his 3s in the first game, he finally hit from long range midway through the second Tuesday. Warriors: Kerr attended his second game this series but again watched behind the scenes as he recovers from a May 5 procedure at Duke University to repair a spinal fluid leak. … Golden State’s 23 first-half assists were its most ever in a playoff half, topping 22 against Phoenix on May 4, 1994. The Warriors notched their fourth 30-assist game this postseason. Published: May 16, 2017, 8:33 p.m.